ADAC has the stringest and most trusted criteria system. The products that get good and very good results have much higher quality then it is required by law. They usually choose seats to be tested that have been released since the previous test. Below you can read about their criteria system and also how their final rating is built up from all the aspects. If you are not familiar yet with the ADAC test method you can read more on this page. There are five different criteria and a final ADAC result that is based on the criteria in different percentages. Safety, operations, and ergonomics make the 100%, but if there is pollutant in the material that the baby is in direct contact with then it can cause devaluation in the final ADAC result. Also, all three components are built up from different tested elements. The overall ADAC result is based on the three most important criteria (safety, operation and ergonomics) with possible devaluation for pollutants. ADAC chooses the seats they are going to test in the next test according to market relevance and innovativeness. From time to time new seats can be a problem, as they work with approximately half year lead time. It means that if the new seats have not been produced, or they are too early in the market, they can only be tested in the next year. These seats cannot be tested afterwards in the same year (when they are released) because of the high cost. Seats that have already been tested in previous years, will not be tested again if they were not changed. Their results remain the original ones. An important element, testing seats for pollutants became a part of the test in 2011. As a result, tests since 2011 cannot be compared with the tests before in the same way – the requirements are bit different and higher since adding the pollutant test. All the seats are bought anonymously in the shops. ADAC tests the safety of the seats both for front and side impact, used by a VW Golf VI (Opel Astra until 2011). The frontal impact is at 64 km / h and the side impact at 50 km / h – they are both above the legal minimum requirements of UN ECE Reg. 44. 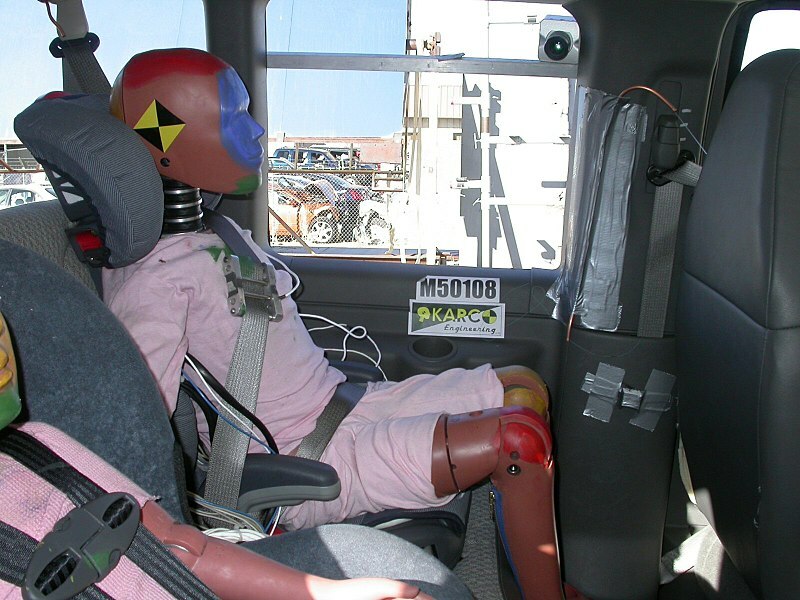 The dummies, used in the safety seats are different sized, and tested both in sitting and resting position. Furthermore, other elements are also added to the tests, which are: layout of the belt, size adjustment, stability on the car, and headrest. Since 2011 ergonomics has been checked as well (space, child’s seating position and how much space is needed in the car to install the seat). Installation and possible misuse are also measured. Testing for pollutants the part that the child can be in direct contact has been in the test since 2011. This include the followings: PAHs, phthalates, flame retardants, phenolic compounds, organotin compounds, AZO dyes and heavy metals. UN ECE Reg. 44 and 129 – these are the official registrations for car seats. Based on this,seats with UN ECE Reg. 44/01 and / 02 are not allowed to be used anymore. By law side impact test is still not a compulsory element, but ADAC has been testing it since 2001 because of the high risk of injury. This just an example, why so many seats can still be on the market, even though they got very poor rating from ADAC. Statistics show, that these seats – thank God – mostly quickly disappear from the market and the brands develop something new and better, or they even exchange their seats with poor rating for safer ones.